Windows 10 wants to make sure your system is automatically updated, but sometimes that’s a problem with hardware drivers. Windows 10 likes to keep your system up-to-date with the latest feature and security updates. This includes keeping your hardware updated, too. However, that doesn’t always work out. With so many different hardware manufacturers and devices, the automatic updates sometimes break your webcam or graphics card. For example. If you find your devices aren’t working correctly after an automatic update, here is how to disable the driver updates but still receive other important security and feature patches. 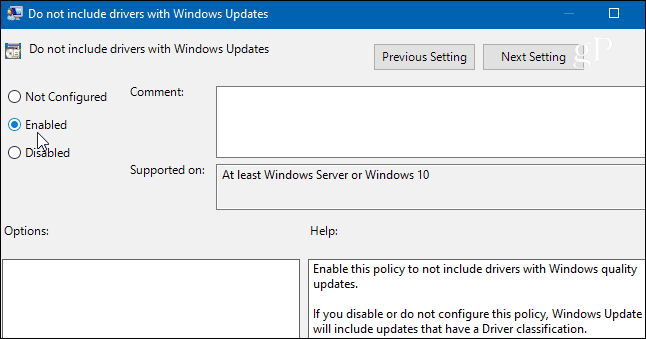 If you’re running Windows 10 Pro, the simplest way to stop automatic driver updates is through Group Policy Editor. Hit Windows Key + R and type: gpedit.msc and hit Enter or click OK.
Then double-click on “Do not include drivers with Windows Update” in the right pane. Select Enabled on the next screen and then click OK and close out of Group Policy Editor. If you’re running the Home version of Windows 10, you don’t have access to Group Policy Editor and instead will need to hack the Registry. Note: Making changes in the Registry isn’t for the faint of heart. Before making any tweaks in the Registry, make sure to create a Restore Point or do a full system backup first. 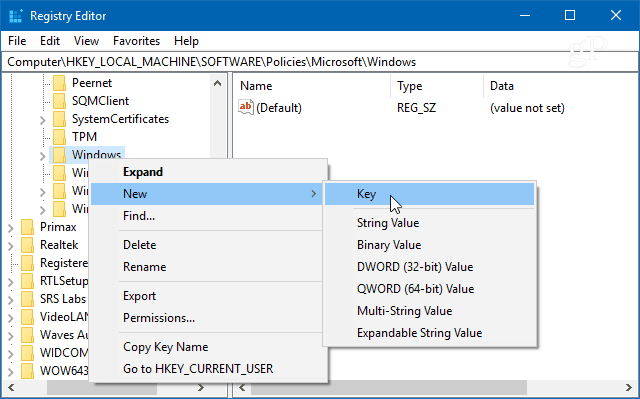 To launch the Registry editor, hit the Windows key and type: regedit and hit Enter or click OK.
Right-click the Windows key and select New > Key. 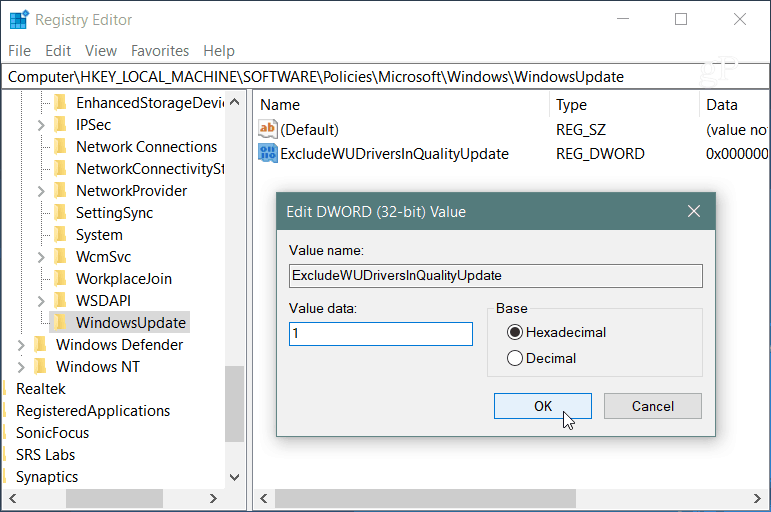 Name the new key WindowsUpdate and give create a new DWORD (32-bit) Value of ExcludeWUDriversInQualityUpdate and give it a value of 1 and click OK. Whether you’re running Windows 10 Home or Pro, after making the changes, you’ll still get regular security and feature updates, but driver updates for hardware will be excluded. Of course, now you’ll need to make sure to keep your device drivers updated manually. Typically you can do that by checking the device’s website or use the update utility that comes with your hardware device. Such as an NVIDIA graphics card, for example. For the most part, automatic driver updates work pretty well, especially on Microsoft’s own Surface devices. But if you build your own computer, or replace or upgrade hardware, sometimes automatic drive updates can muck up your system. 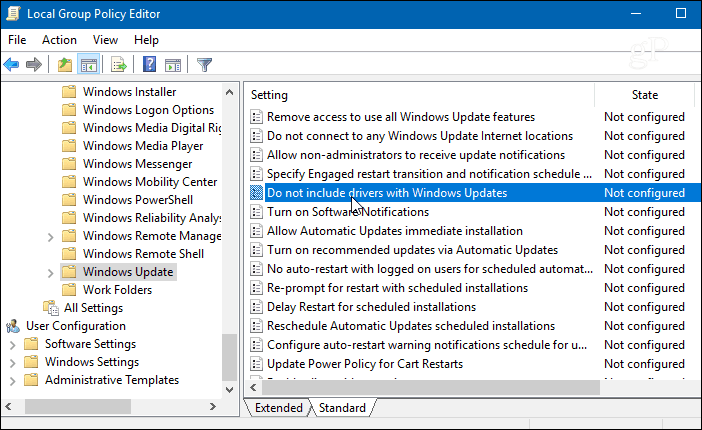 This ensures you’ll be updating your hardware when you’re ready for the new drivers.